Glisten has the population located in one or more dwarf planets or planetesimals in a co-orbital position, an asteroid belt. The system has a population over one billion. It has a well-developed manufacturing and processing industries. The world serves as the capital for the subsector. This is a high technology world with available technology over the standards for Charted Space. It is a member of Third Imperium in the Glisten Subsector of Spinward Marches Sector and in the Domain of Deneb. Glisten, as a member world of the Third Imperium, holds the estate of an Imperial knight and the feifdoms of a count and the Subsector duke. All three are members of the Imperial Nobility charged with overseeing the world. This world has a nearby Imperial Naval Base, capable of handling warships and an Imperial Scout Base, capable of handling Scout Service starships and personnel. Glisten has the population located in one or more dwarf planets or planetesimals in a co-orbital position, an asteroid belt. The system has a population over one billion. It has a well-developed manufacturing and processing industries. The world has a colony on Melior (Spinward Marches 1736). The world has a colony on Weiss (Spinward Marches 1934). The world has a colony on New Rome (Spinward Marches 1938). The world serves as the capital for the subsector. This is a high technology world with available technology over the standards for Charted Space. It is a member of Regency of Deneb in the Glisten Subsector of Spinward Marches Sector. This world has a nearby Regency Naval Base, capable of handling warships and a Regency Scout Base, capable of handling Scout Service starships and personnel. Please also see Glisten (system) for more information. Glisten is one of the major high-tech industrial centers of the Marches and consists of a number of separate planetoid cities, most of which specialize in a particular industry or social role. Information about the Glisten system can be found here. The Glisten system is centered on the star Gliss. It has a single gas giant, Nasmi, and no rocky planets. There are two planetoid belts, of which one is designated as the mainworld. This belt is home to most of the system’s population, who would not normally refer to themselves as Belters. That term carries with it connotations of small mining habitats and semi–nomadic prospectors whereas the people of Glisten live in large cities. The fact that their homeworld happens to be a belt does not give them any sort of kinship with Belters proper – and most ‘real’ Belters would agree wholeheartedly. Glisten contains two asteroid belts, the Glisten Belt and the Pluvis Belt, circling the star, Gliss. Although both are highly populated, the Glisten Belt is designated as the mainworld. Sub-planets in the main Gliss Belt and the Pluvis Belt typically have diameters of less than 1000 km; the minimum size to achieve a spherical shape is approximately 600 km, depending on the mineral mixture of its composition. Bodies between 60 km and 600 km tend to be a bit 'lumpy' or irregular in shape, with those smaller than 60 km tending to be radially non-symmetric. Glisten has a pressure of less than 0.001 atmospheres, which requires the use of a vacc suit. Glisten is the collective name for a large number of settlements in the inner planetoid belt orbiting a solitary star; a center of commerce and industry—not just for the subsector, but for the entire Spinward Marches. The name derives from one of the early and primary settlements on the asteroid named Gliss Ten. Glisten, as a member world of the Third Imperium, holds the estate of three members of the Imperial Nobility, who are charged with overseeing the world. Glisten has an excellent quality starport. Glisten has a Civil Service Bureaucracy government. Glisten serves as the Imperial Subsector capital. Glisten possesses a Technology Level of TL–15 or TL-F in Hexadecimal Notation. The population of the Glisten system numbers in the billions, housed in large cities built on asteroids all through the belt. Each city has its own administrative apparatus, all of which ultimately form part of the efficient but dull Glisten Coordinating Authority, a civil service government that runs the system as a whole. Laws are moderate but with so many settlements, housing vast numbers of people, scattered across the entire system, a rather stodgy administration has emerged with a fair amount of red tape wrapped around almost any activity. The capital of the system is Glisten City, a huge metropolis that grew out of the much smaller Gliss Ten settlement chosen as administrative center for the system long ago. Glisten City is the site of the huge starport and serves as the main center for trade and business of all kinds as well as the administrative capital. Many other cities are fairly specialized in their industrial or social activities. There are several cities each specializing in agriculture, light and heavy industry, and even an artists’ colony. However this is not taken to extremes. Almost all settlements have some industry, some food production and some technical capabilities. There are a number of more general settlements, but these are of much lesser economic importance than the great centers for trade and industry. With its large industrial complexes and extremely high tech level, Glisten is an important exporter of technological goods across the sector and beyond. Its shipyards are widely renowned, most are located in the outer belt, named the Pluvis Belt. Among the installations there are an enormous yard owned and operated by Ling-Standard Products as well as smaller and more specialized shipbuilders such as Bilstein Yards. 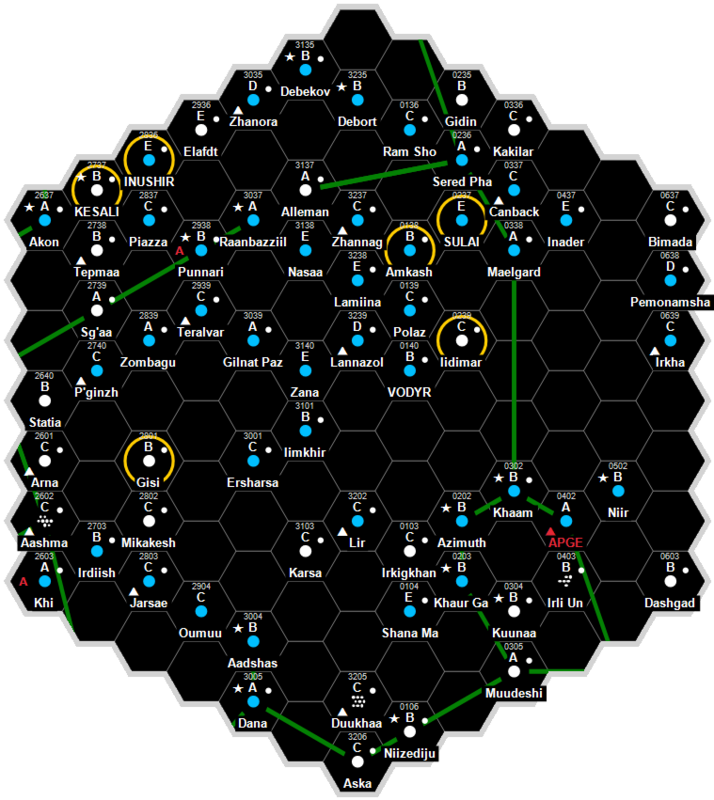 The Pluvis Belt is also the site of Glisten’s naval base, home port of the subsector fleet. The immediate region around the base is a restricted area and is heavily patrolled, with sensor outposts constructed on a number of asteroids to give better coverage. Glisten also has an extensive Scout base, which is located in the main belt near the starport. In addition to a huge fleet of cutters dedicated to the ongoing effort to chart and catalogue every asteroid in the belts, the base is home to the usual flotilla of communications and exploration vessels. The Glisten system attracts large numbers of students to its academic institutions, which include the Glisten Institute of Planetological Studies (GLIPS) and the Mining School of Glisten, which is associated with GLIPS but autonomous. The Mining School receives funding from several corporate and Megacorporate sources, which offer scholarships for promising students in the prospecting, extraction, processing and management disciplines. Ex–students are recruited in large numbers by mining corporations across the sector. There is also a community of what could be called true Belters within the system. Although not officially part of Glisten’s population and not counted among it, the Belters are subject to local laws while they are in–system and most are willing to comply. However, there are groups who routinely ignore comm–channel restrictions, traffic control instructions and other governmental rules which are considered very important by the people and government of Glisten. Martin Dougherty, Neil Frier. Behind the Claw (Steve Jackson Games, 1998), 98. This page was last modified on 7 April 2019, at 07:48.